Boston quidditch has long been hounded by pundits for refusing to leave its beloved home city and judge themselves against the elite of other regions. While it’s hard to blame them – after all, why bother leaving such an isolated city if it contains much of the Northeast’s talent – it made it impossible to measure them against other top teams. And, when the city failed to put a single team in the Elite Eight of World Cup VI, the critics were handed their arguments against such a sedentary schedule on a silver platter. But with the stakes higher than ever and the opposition only getting stronger, No. 9 Emerson and No. 16 Tufts made the decision to travel to Turtle Cup III, and, at a tournament that included Mid-Atlantic power No. 7 NYDC Capitalists and the hosting No. 10 University of Maryland, made runs all the way to the finals, showing the world that East Coast quidditch still goes through Boston. And it was the Lions, making their first trip to a non-regionals or World Cup tournament since March of 2012,that dominated the final game, taking down their crosstown rivals and winning their first tournament of the season by a score of 160*-30. The finals were a far cry from the hard-fought, intense matchups of the rest of the tournament, and even from the three-game set the two teams had played a week earlier. Tufts, coming in fresh off a 37-minute semifinal match and with starting beater Michael Sanders sidelined with a cramping calf, were dominated from start to finish, with Emerson beaters Aaron Wohl and CJ Junior doing much of the work while sitting in the middle of the new Emerson zone defense. The result was plenty of weak offensive possessions for Tufts after failing to disrupt the opposing beaters, creating eight or nine bludgerless breakaways for Emerson, and while snitch Ricky Nelson worked hard to keep the game going, the result was truly never in doubt. In the quidditch world of late, people seem to like to excuse away results. So let me give you the excuses Emerson could have used this weekend. They were without one of their top female chaser, Madeline Smeaton, for the weekend, and lost starter Capri DeBiccari to an emergency room trip Friday night, leaving them with just one female chaser on the roster for Saturday. A 10-hour ride down plus the hospital trip left many of them almost without sleep the night before. And Pablo Santiago, arguably the team’s best male chaser, wasn’t present. But one of the game’s proudest programs didn’t need to make excuses, even after a disheartening loss to the NYDC Capitalists to start the morning. Emerson dominated the bludger game, rarely losing it and getting it back almost immediately when they did, including three instances of Wohl catching pointblank beats from Amanda Dallas. And even though Fox was off his game for the early morning start, the Lions were able to build up an advantage as the snitch, Devin Sandon, returned to pitch. Luckily for the Capitalists, Freddy Varone picked a good time to have the seeking performance of his life, with two grabs coming in quick succession to force overtime and seal the 130*^-110 victory. Emerson quickly turned things around, taking down the pool’s two weaker teams easily before destroying a UNC team in the Round of 16 that came into the tournament with perhaps undeserved hype. That sent them to the quarterfinals and a marquee matchup with Maryland. Emerson ceded bludger control to the Terrapins from the beginning, electing to rely on the strength of their defense rather than trying to be aggressive with their bludger and go point-for-point with the hosts. The ploy worked, as each team had to fight for every last point they scored, with many of the goals that were converted coming off of man advantages following fouls. 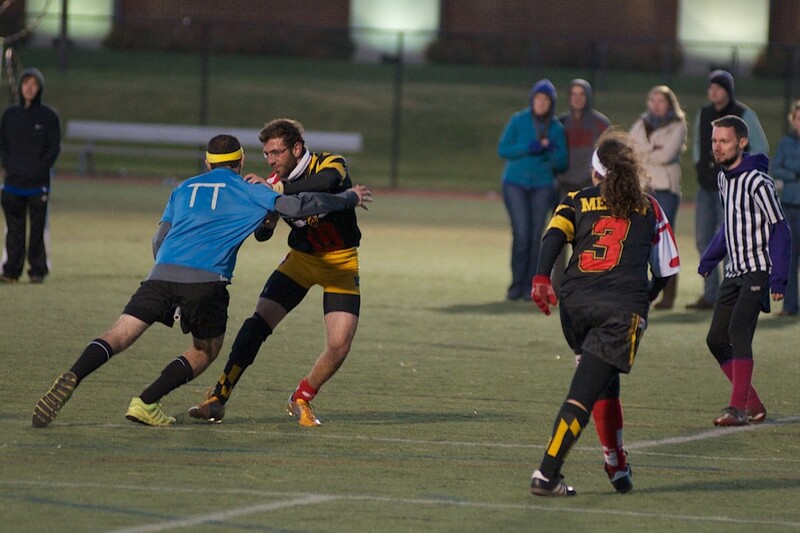 The snitch returned to the pitch with the score level, and while Maryland began to pull away with the beaters concentrated on seeker play, they couldn’t get far enough away before Emerson made a grab. From there, nothing was stopping Emerson, and they cruised their way to the tournament title, dispatching Villanova 100*-20 in a comprehensive victory before beating down Tufts in the finals. What’s perhaps most impressive is that what we saw from the Lions this weekend is a fraction of what they are capable of. Santiago will return, Jake Hines, who was huge on offense for the team this weekend, will be taking more competitive reps, and Eli Page, who I will continue to hype up, is finally developing an offensive game. Plus, they won’t be down their two best female chasers every weekend. Emerson is a structured, discipline team, and at full-strength this may be one of the strongest squads the program has ever put out. The opposite side of the bracket from Emerson had a semifinal matchup that, if a full video ever surfaces of it, will undoubtedly go down as one of the great matches in the sport to date. 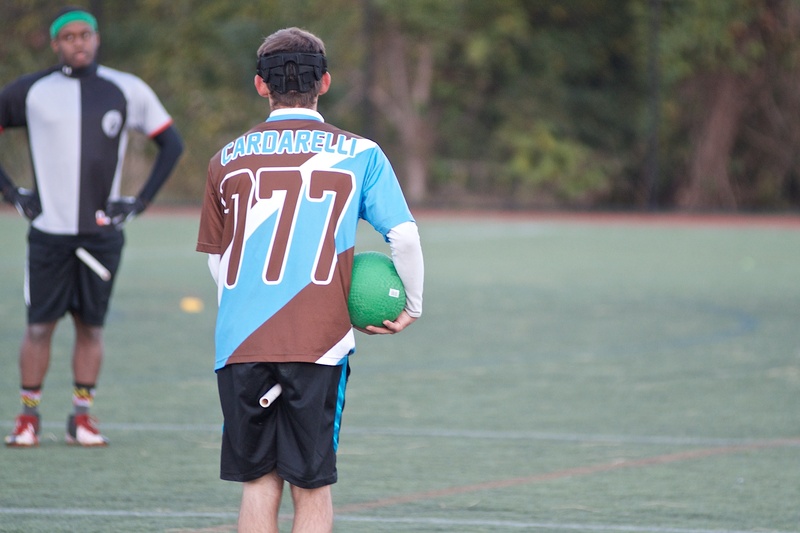 It featured two teams in very different places: a Tufts team looking to make a name for itself and an NYDC Capitalists squad that has been forced to live up to the expectations and deal with the malice that has been consistently heaped on them since before they ever even played an official game. From brooms up, it was clear that, much like Emerson, Tufts held a sizable beating edge over the Capitalists, and leveraged bludger control and some poor decision making defensively from the opposition into an early 30-0 lead, largely on the back of chaser Max Leonhardt and keeper Steve Mullahoo. But as the first lines subbed out, momentum shifted, as it was Tufts turn to make a few mistakes, which John Gaffigan and Tony Greco quickly turned into points on the other end. From there, things largely stabilized, with Tufts occasionally pulling ahead before the Capitalists answered right back. When snitch Harry Greenhouse returned to the pitch, the match was still in snitch range, and as both offenses exchanged points, Greenhouse powerfully held off his opposition. The result was a game that ticked past 30 minutes with at least five grabs already called off and seemingly no end in sight. Finally, with Greenhouse tiring and the game heading towards 40 minutes, Tufts made the aggressive move to play a two-male beater set to give their seekers the advantage. It was only thanks to an impressive effort from Hannah DeBaets and Emily Hickmott at chaser that Tufts was able to stay even in the quaffle game long enough for BJ Mestnik to finally come through with the game-winning pull. So where do these two teams go from here? For NYDC, it’s really a matter of ignoring what people are going to say about them. The Capitalists have somehow become the Yankees of the sport, and they have and will be eaten alive for the result. But they also beat a very strong Emerson team on the same day, and are still coming together as a coherent unit, just as Lone Star and the Massacre are. The one potential thing that can ruin this season for NYDC is its beating. As of now, the squad doesn’t have a single above-average beater, and Emerson and Tufts both exposed it. Any other top team they play will as well, and no matter how strong their chasing and seeking games are — and both are very good — it won’t matter. Tufts, on the other hand, might finally be making a case to be in the discussion with the best teams on the East Coast. Their ability in the quaffle game runs deep on both the male and female sides, with Leonhardt and keeper David Stack both making names for themselves with plenty of big goals, while Mullahoo, the team’s starting keeper, is a name that has gone under the radar for far too long. With Sanders, they have one of the three best beaters in the Northeast, and while there is a dropoff from there in the bludger game, Matthew Cardarelli is a very serviceable second-line player. But, perhaps most importantly, Tufts seems to have fixed the seeking problems that plagued them for much of the beginning of the season. After inability to catch a snitch cost them their game against McGill and first two matches with Emerson, the team turned to Mestnik, an athletic chaser who was abroad last year, to take over yellow headband duties. All he has done since is catch snitches to beat Emerson, Penn State and the Capitalists, while not losing a single one when it matters. With him as their potential answer at seeker, if they can just toughen up the physicality of their defense a bit, Tufts has a real opportunity to make headlines this year. Villanova may no longer be a regional title contender, but Julia Fillman is an All-American level female chaser. After having a breakout tournament at Northeast Fantasy under the watchful eye of Zach D’Amico, her old captain, she once again impressed here, and for large periods of time in her quarterfinal matchup with Penn State was able to take over the game, capable of everything from pinpoint passes to physical defense. Speaking of Penn State, Scott Axel once again proved himself in the beating game, but the Nittany Lions might not have the pieces around him to contend anymore. On the simplest level, Penn State lacks elite size, which is the one thing you simply can’t fix with effort. This team isn’t headed off a cliff, and their narrow loss to Tufts and close game with Maryland at Nittany Cup speak positively of what they’re capable of, but it could be a long season against the sport’s elite. Hofstra may not have much going for it this year, but the beating duo of Alex Leitch and Theresa Buchta may be able to compete with Max Havlin and Katrina Bossotti for the best in the Northeast. And, when you have good beating, as they proved in their matchup with Rochester, you can hang in or even dominate games. Jaime Colon is also back for Hofstra, and suddenly it looks like maybe they could be a top four team in the Northeast again this year. Which brings us to Rochester. There was plenty of hype over the Thestrals in the preseason, with many analysts sticking them in the top three of the region. But on Saturday, they seemed like the same old team, too reliant on Devin Sandon and lacking sufficient depth to contend with the elite. The Maryland blowout is the kind of thing that will happen, but the Hofstra loss cannot. They have a lot of work to do before regionals, and will have to hope Sandon recovers from a few knocks he received as well. 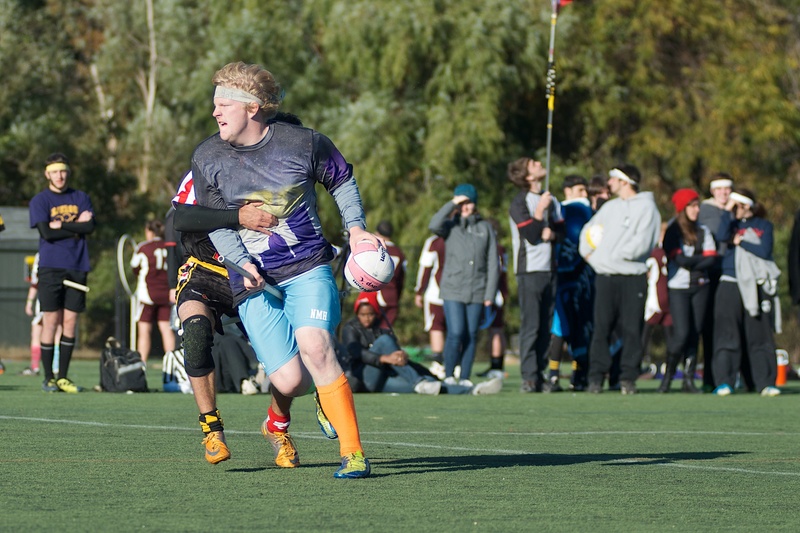 High-level tournaments mean exciting, close games and controversial snitch grabs, and Turtle Cup was no exception. From games I saw, the grab that pushed Tufts over Penn State and the one that allowed Emerson to move past Maryland were the most debatable. Both involved bludgers – for Penn State is was whether the bludger hit, for Maryland it was when. Both head referees did a good job of being patient and gathering information, and I’m fairly confident the Emerson call was correct. But the Tufts grab was much closer, and we may honestly never know the right answer. And if that call doesn’t stand, who knows how far Tufts actually makes it on Saturday. But while I’m always happy to talk about the calls that I find to be the most unnecessarily controversial from week-to-week, I also want to use this space this week to highlight what I thought was a truly elite job of snitch refereeing from Samantha Medney of Maryland in the game between Tufts and NYDC. If you watch the tape of the seeker play, and I highly suggest you do to appreciate just how impressive Greenhouse was, you will see a referee that is consistently well-positioned, observant, and decisive. And she needed to be, because some of the calls she had to make needed to be inch perfect. At one point, she sees a good grab and cannot see the beat that happened on the far side of the body. She calmly gathers all of the information and finds out about the beat from a bludger referee, rules the call no good herself and lets the game continue without an unnecessary stoppage. A lot of referees can learn from Medney’s performance in this game.